It’s the most magical time of the year! 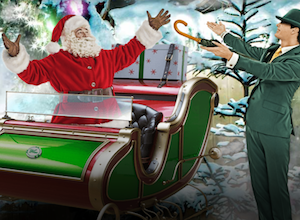 Christmas is waiting and Mr Green is feeling generous – as usual. At this online casino you will be able to log in every day until the 8th of January 2017 and grab a new offer. There are so many great surprises waiting at Mr Green right now and the amazing gifts are worth a total of £350 000! You can find offers in the casino, the live casino or in the sports book. Keep in mind to log in every day if you don’t want to miss out on anything. Then you can check out “Mr Green Christmas Winners List” in order to find out if you’re one of the lucky winners. Today, the 23rd of November, you can visit Mr Green and play 40 rounds on the cool videoslot Big Bad Wolf. If you do you will enter a spectacular draw where you will have the chance to win one of three exclusive coffee machines from Nespresso! Make sure you enter the competition before 23:59 CET tonight! As you may already know there is a brand new videoslot from NetEnt coming to Mr Green tomorrow – the 24th of November. We’ve all been waiting on Warlords: Crystals of Power for a while now and to celebrate Mr Green has put together none the less but three different tournaments. If you’re one of the brave players entering the race you will be able to win some serious cash prizes! For every £1 you wager on Warlords: Crystals of Power during each tournament you will earn 1 point. The more points you claim the higher you will climb on the top list. The first tournament starts tomorrow and will go on until 23:59 on the 27th of November and the prize pool is set to £500. Tournament number two will start on the 28th of November and continue to the 1st of December with a prize pool of £1000 and last but not least the third tournament will take place between the 2nd and 5th of December with a prize pool of £1500. If you can’t get enough of all the promotions at Mr Green we can give you a heads up about another one where you can win even more cash prizes. From the 24th until the 30th of November you can collect tickets to a draw with £10 000. You will get a ticket for every 20 rounds you play with at least £0.2 per spin on the new videoslot called 7 Sins. 25 lucky players will win a share of the prize pool! Also during the same promotion you can claim free spins by playing 7 Sins at Mr Green. You can claim up to 100 free spins if you want. For every £10 you wager you will get 15 spins, for every £25 you wager you will get 40 free spins and for every £50 played on 7 Sins you will get 100 spins.